Landscaping with container gardens goes beyond decorating. Landscaping uses container gardens alone, or in groups to create walls, borders, barriers or rooms in your outdoor areas. It works to provide privacy and practicality while adding beauty. 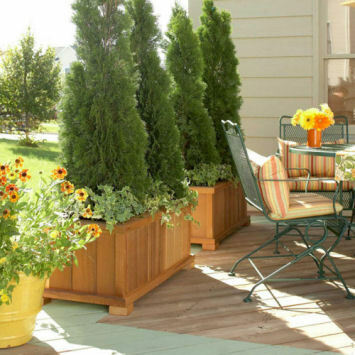 Going beyond decorating, landscaping with containers can help create outdoor rooms. 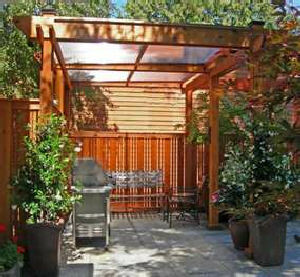 Use trellises, pergolas or arbors to create walls. Place your plants nearby and train them to vine along these structures. They will provide shade, privacy and noise reduction. 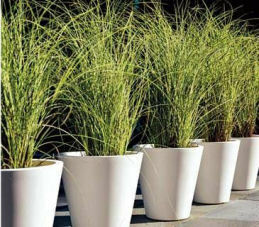 Plant shrubs, small trees or ornamental grasses in containers and line them up to do the same thing. Create a corner or a whole wall. They create a natural privacy screen without adding any kind of structure. Using planting boxes makes it easy to create a wall or corner up an area. Arrange them in a line, corner them up at 90 degree angles or set them perpendicular to one another to divide up outdoor areas. Container gardens allow you to create an outdoor retreat in pavement-only areas. 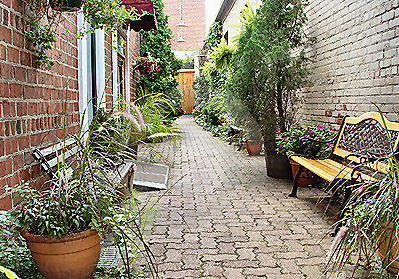 This paved alley or walkway between buildings is devised to have a park-like feel for its residents. Trees, shrubs, foliage and flowering plants work together to create a garden on the pavement. Add a bench or two and it makes a great place to enjoy the outdoors in the city. 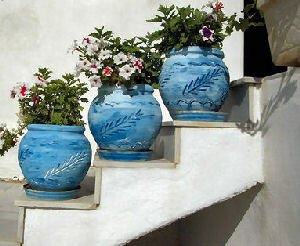 Use your potted plantings as focal points in your outdoor areas. Draw the eye of of a viewer to the focal point. I use hanging containers in a tree in my backyard in an effort to draw the eye upward from the ground below. The ground under this tree is almost impossible to grow with nice grass, and my dogs keep it worn down anyway. Shade flowers like fuchsia and impatiens give a lot of color just under the leafy lower limbs so that is what you notice instead of dirt. 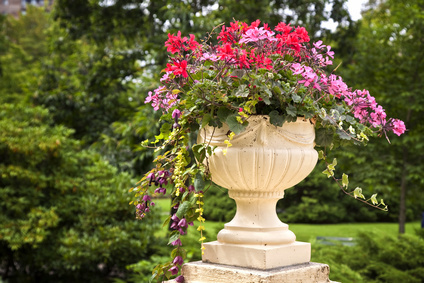 Add a single container in your garden beds – raise it a little on bricks or a pedestal to emphasize it even more. I do this in my shade garden which is planted mostly in foliage perennials like hostas, nettle and ivy. If you have an area like I do with mostly foliage, make your raised container with colorful annuals to accent the foliage plants. 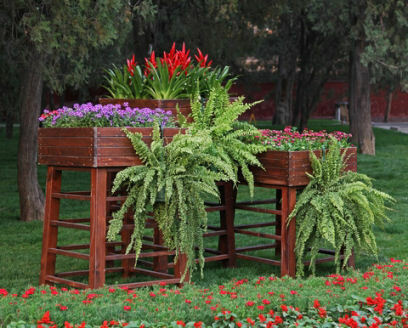 On the other hand, if you have a garden bed full of flowers, make your raised planter with foliage plant in contrasting colors. They will accent and define one another. If you have a large area that you want to break up with either added flowering or foliage plants, lift two or three containers up above the garden bed and stagger their heights. Here is an interesting grouping of containers, lifted on rustic looking tree stumps and positioned on the ground and wagon – the heights vary and it fills up this big corner well. 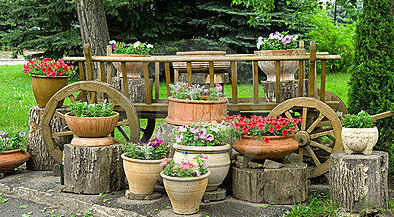 Landscaping with container gardens can direct the flow of traffic in your outdoor areas. 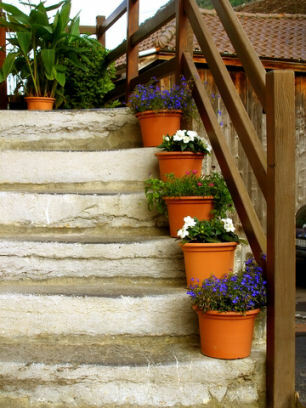 Set pots or boxes on landings as you make your way up stairs – or if the stair steps are wide enough, place containers on every few steps – repetition is appealing and signals that you are still moving upward. Place containers along borders or paths – use them in conjunction with path or landscape lighting. Containers can direct traffic or impede it. Below, the potted evergreens create a wall to separate the outdoor dining area from the lawn. Another way to landscape with containers is to use them as buffers or transitions. 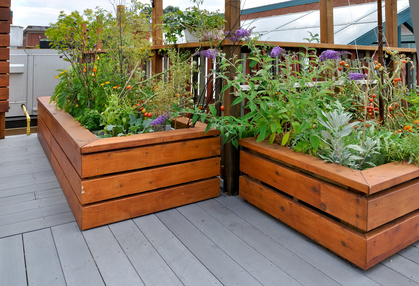 In urban settings, your container gardens will buffer your outdoor areas from asphalt, other buildings and noise. At your suburban home, your potted gardens can make the transition from your deck, to your patio, to your pool area, to your yard. They will connect the spaces – especially if you use some of the same plants or colors in all of these areas. If there is something you don’t like about your home, camouflage it with a container garden. 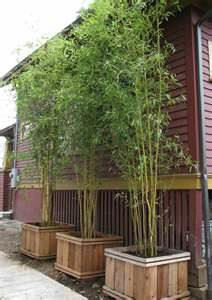 Line up several containers of the same plant, shrub or tree for greater impact. Break up long expanses of siding or brick with window boxes or large planters. 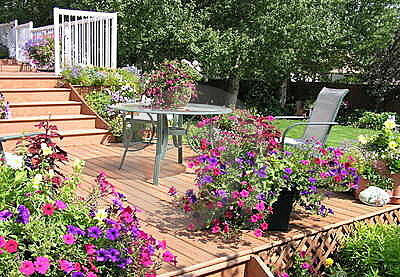 Even if you’re renting, make the investment to give your home curb appeal with potted flowers, shrubs and trees. If you move, landscaping with container gardens lets you take your gardens with you.